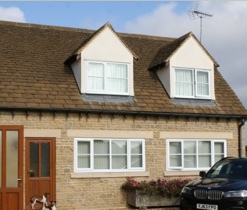 Set in countryside on the edge of the village of Ashton Keynes, in the Cotswold Lakes and Water Park, these two tastefully furnished selfcatering apartments offer a break away from the hustle and bustle of busy towns. 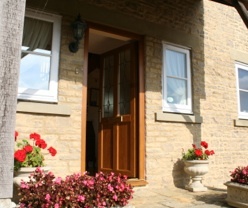 Our newly built self-contained holiday apartments are adjacent to the farmhouse and within the private grounds of the house. Both apartments provide excellent levels of comfort and are very spacious, light and airy, recommended for both business and holiday guests alike. There are several pubs nearby, one is within walking distance. We regret young children, pets and smoking are not permitted. We have no fixed changeover days, so please contact us for availability and pricing. 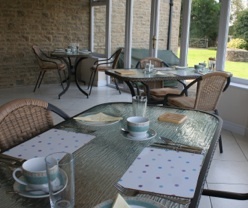 We are open all year round for weekly bookings and short breaks, we are able to offer stays from 3 days to several weeks depending on your requirements. Three night short breaks from £225 depending on time of year. Bookings are confirmed on receipt of a deposit equal to at least 25% of the total accommodation cost. Please make cheques payable to 'Gill Gleed'. Sorry we do not take credit or debit cards at present. Deposits are non refundable in the event of a cancellation. The balance of the accommodation cost is payable on arrival at the accommodation. On receipt of the booking confirmation, all guests should check the booking details and contact Gill as soon as possible to amend or change any part of the booking if it is incorrect. Apartments are available for occupation from 4.00pm on the day of arrival and we ask guests to vacate the apartment by 10am on the morning of departure unless alternative arrangements are agreed in advance. We reserve the right to charge for any non-trivial damage or for apartments left in an unacceptable condition. To maintain the high quality of the apartments we regret pets and smoking are not permitted. Parking is off road and free. Your reservation of an apartment is taken as your acceptance of our terms and conditions.